The ability to place hair follicles closer together during transplant allows the surgeon to increase the density of the transplanted area during one session. The main benefit to ultra-refined hair restoration is that the increased density means that many patients can get the look they want in a single session. Smaller microsurgical tools allow the hair restoration surgeon to make smaller recipient sites for the donor hair, which in turn, allows them to be closer together. At the same time, technicians are now able to remove more of the tissue surrounding the hair follicle prior to its transplant. 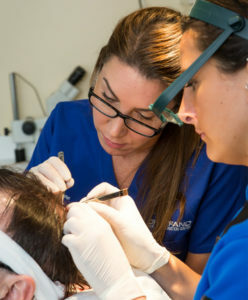 Combined, these techniques allow for grafts to be placed at a density up to 60 follicles per square centimeter. The result is great hair transplants-often in only one procedure.